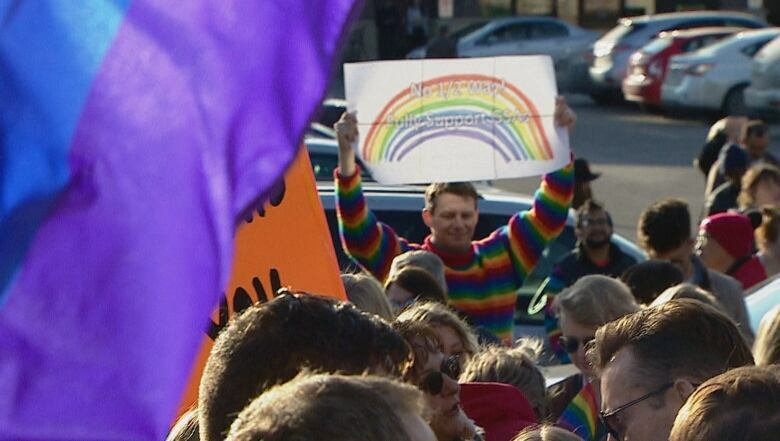 Hundreds of people marched in southwest Calgary Thursday in support of gay-straight alliances, and to oppose a plan that they say could see LGBT kids outed without their consent. The school groups, which are typically student-run and teacher-supervised, offer a place where LGBT youth can socialize and meet other supportive students. Legislation came into effect under the NDP in 2017 that protects the establishment of gay-straight alliances, or GSAs. The law also prohibits schools from telling parents when their child joins the group. With an election scheduled for April 16, advocates are getting anxious to oppose an effort to change that legislation. United Conservative Party Leader Jason Kenney has said he intends, if elected, to give Alberta schools the discretion to inform parents of their child's participation in a GSA. That announcement has been criticized by LGBT advocates, school administrators and teachers across Alberta. 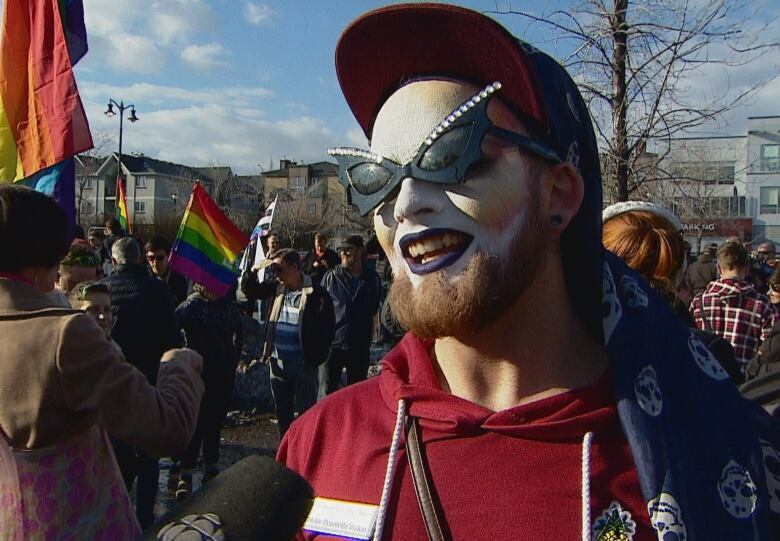 "For a lot of people in the queer community, coming out is very important and special moment for us, and it's the one thing that we get to control — how it's done and who we come out to," Myles Nahal, 18, said at the rally. "So in Jason Kenney's new policy, if it happens, he's taking away the one thing that we do get to control." The protesters started at the Marda Loop Safeway parking lot and headed to the campaign office of Calgary-Elbow's UCP candidate, Doug Schweitzer. 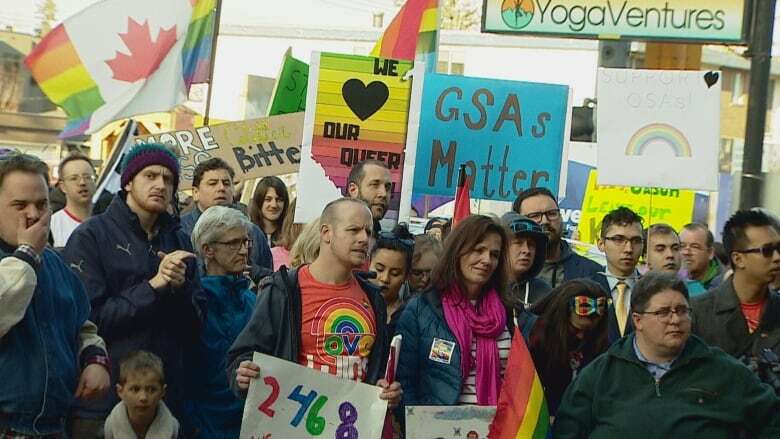 Members of other major political parties, including the NDP, Alberta Party and Alberta Liberals, attended the march to show support for GSAs. Schweitzer did not attend but sent a statement to media outlets when the protest began. In the statement, he said he was "proud that all major political parties support gay-straight alliances and categorically reject mandatory notification of parents." Giving teachers and principals any discretion to notify parents would put kids at risk, protesters said. Some Albertans believe parents should have a right to know what their kids do at school. One marcher, Sister Donatella, said that as a teen, her parents allowed her friends to stay overnight after they had fights with parents over their sexuality. "It's terrible to think of someone going and finding a support network finally, only to be scared of using that support network for fear of what might happen with their home life," said Donatella, who volunteers for HIV awareness. There have been multiple studies that have shown LGBT people face higher rates of violence, homelessness and suicide than the heterosexual population. Many at the rally offered stories of when coming out as gay or trans resulted in negative family reactions. 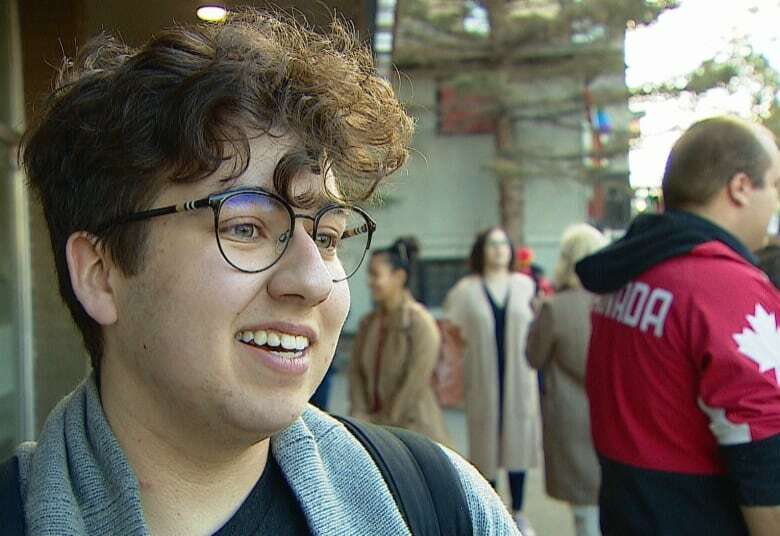 Nahal, who identifies as queer and transgender, smiled when describing how being part of a high school GSA in Calgary helped him get to know himself without being outed to his parents. "It's like I stepped out of a fog and just understood everything. That really did save my life because I was at a really low point before being in a GSA," Nahal said. "Just meeting more people who were queer and trans lightened my world for me and just really saved me." It also meant that he felt empowered enough to tell his own parents. Other GSA members explained their experience coming out, and shared tips. They were there to support him the whole way through, he said. "For a lot of parents, GSAs don't teach their kids to hide this from them," Nahal said. "In fact, it empowers kids to grow in their own identity so they're comfortable to come out to their parents." Kenney announced the UCP education platform on Monday, which included proclaiming the former Progressive Conservative government's Education Act (2014) to replace the NDP's amended School Act. Facing criticism, Kenney said his party's proposal would offer the strongest legal protections for GSAs in Canada. He said it would be up to teachers to decide whether it is in the best interest of a child to tell their parents that they are involved with a GSA. Such notification would not be common — likely only in cases where the child is very young or has unique emotional and mental health challenge, he said. Critics marched Wednesday in Edmonton in protest. One advocate said he knew people who were considering moving out of Alberta should the UCP get elected, due to the party's position on this issue. An earlier version of this story incorrectly reported the crowd size at about 100 people. In fact, several hundred attended.